It’s not on rails. Glory be. 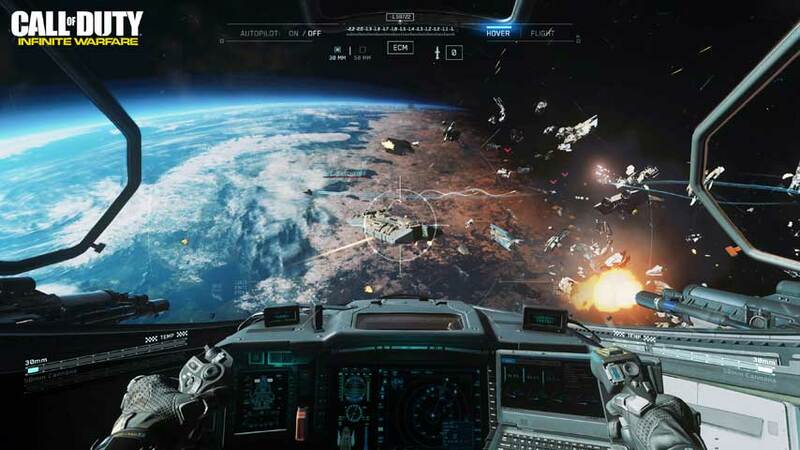 Call of Duty: Infinite Warfare takes players to space, something which has proved a controversial change of direction but is at the very least interesting. Although not everybody’s in love with the idea of taking the fight to orbit before crashing into other ships to get down to the familiar Call of Duty business of running down corridors, a new snippet of information suggests there’s more to this space business than we suspected. The generally reliable Charlie Intel has word that the Jackal flight demo shown at Sony’s E3 2016 conference was not an on-rails sequence: the player has full control over the ship’s direction. This is pretty amazing in the context of modern Call of Duty, a series so determined to keep you on the rails at all times that you can get through the campaign on lower difficulty levels by letting the AI do all the work and occasionally moving your character along a preset path. To be able to steer a vehicle implies there’ll be somewhere to steer the vehicle towards. Gosh! We haven’t seen that since the series left WWII. It’s also just plain exciting because vehicle missions in Call of Duty are generally pretty bombastic (as opposed to the rest of Call of Duty, ah ha ha) so the idea of being in full control of all those explosions and collisions is a pleasant one. Call of Duty: Infinite Warfare releases in November for PC, PS4 and Xbox One, and we won’t be terribly unhappy to find out more about it.